Eating: Our restaurant is open tuesday through sunday from 8 am to 4 pm. Sleeping: Many huts and our hammock sleeping place can be seen through our website. Dont miss the WebSpecial! Links: Check out our link section for more information about Zipolite and Oaxaca. Feel free to add missing links! Sitemap: A detailled overview about this website. We hope you like this website, please send any comments and critics to the Webmaster Joël Fisler. Thanks. 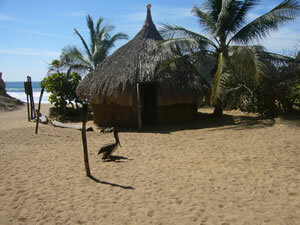 Upper picture: A Lo Cósmico hut with the beach and the sea in the background.